The digital age has reached, and is impacting and changing, one of mankind’s most popular past times – reading magazines. There has always been a plethora of magazine titles to choose from, whatever your age, interests and politics. With the advent of laptop computers, smart phones, tablets and ereaders, the paper and ink versions of our popular magazines may soon be a thing of the past. What is the greener option – paper magazines or online? Can the green option save you money as well as the environment? An interesting statistic relating to this question is that, while online audiences are growing in number, the circulation of printed newspapers and magazines is heading in the opposite direction. Why are people abandoning their favorite newspapers and mags in favor of digital versions? Are printed magazines going to disappear forever? A thought provoking finding came out of a study conducted earlier this year at the University of Oregon by Arthur D. Santana, Randall Livingstone and Yoon Cho. The study consisted of two groups; one read the New York Times in print form while the other read the same edition of Web-Times. After twenty minutes reading time, all readers completed a short survey. The results showed that the print readers remembered “significantly more” stories as well as topics than their online reader counterparts. Maybe printed media has a place and won’t ever completely disappear after all! But what about the green credentials of both types of magazines – the printed versions require a huge input of time, resources and energy to produce, print and deliver the magazines to newsstands and consumers. Paper used in magazines is mostly sourced from virgin wood pulp so that means a lot of trees are sacrificed so we can read our favorite magazine. Magazines are usually printed on glossy or semi-glossy paper which is more costly to produce than newsprint and doesn’t break down as easily as newspaper does; it is also often not recyclable. This means that magazines create a problem in landfill when they have been discarded. 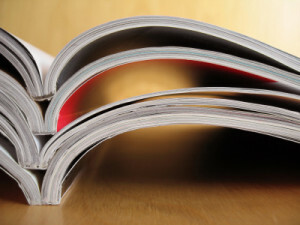 Online magazines cost a fraction to produce and have none of the negative environmental impact of the printed versions. No paper or ink is needed; the required resources are almost nil and so is the energy used to get the magazine out to its readers. Of course, the end user needs to power up their computer or other electronic device to read the magazine but this amount of energy is miniscule by comparison to what is used in the production of the printed version. When an online magazine is no longer needed, it can be deleted with the click of a button, with no impact on the environment at all. An online publication will never clog up any landfill; they have a very small environmental footprint. In recent years several well-known magazine companies have decided to duplicate all or part of the content of their paper magazines online. This has been largely consumer-driven as more people acquire hand-held devices on which they can read books, articles and news stories. So, it’s rather obvious that online magazines are hands down the greener option when compared to printed magazines. So, will you also save money if you opt for the greener choice? Publishers are providing online magazines for readers at a fraction of the cost of buying a magazine at a newsstand; some are even free. You can get a free trial of the online magazine of your choice and then either pay a subscription or pay per copy you download. Both these options are considerably cheaper than the print versions of the same magazine. But will online reading really completely replace print? Many people agree that there is nothing like flicking through a magazine, admiring the glossy pictures. Magazines have always been a kind of luxury item, making them a bit special; perhaps the online versions won’t be able to fully match this experience. So maybe the two formats will be able to peacefully co-exist, a solution for whatever takes the individual’s fancy at the time. What do you think? Will the coexist? What do you prefer to read? I hate reading print magazines or newspapers at this point. It seems so unnecessary! I agree. I things would get even better if tablets and ereaders were even more affordable. They are still more expensive than subscriptions on paper. I really like just doing everything digital but then I am a digital marketing person so go figure. I still know a lot of people who even though they get the digital version still like have the paper copy especially if its something they think will be valuable later. True. There are some collectors out there. Most things though aren’t collectors items. I think it is still a matter of preference. Some are not yet ready to go digital when it comes to reading materials and still prefer the paper version. You’re right. I guess I am just hopeful more and more people will go more green with everything they do. I prefer to read periodicals from an iPad, but books in hardcopy. I can’t stomach the amount of paper waste that goes into printing periodicals when I skim most of the pages anyway on the commute to work. How come you like paper books. I have fallen in love with the kobo app for my ipad for books. Works great. I don’t really like to read on a tablet, I prefer an e-reader like kindle. The tablets are hard on my eyes sometimes, and I like reading outside, and the glare makes it even more difficult. I do like the feeling of a paper back in my hands sometimes. I also enjoy feeling the crease in the newspaper. I really hope that paper never totally goes away. I guess it comes down to preference again. I read on my tablet and I find it works quite good. I don’t have an ereader. I wouldn’t miss paper. You can get regular subscriptions for a fraction of the newsstand price, too–$6 per year, often. I don’t know how they compare to digital subscriptions, though! Digital subscriptions seem to be more. I suppose that’s because advertising revenues are lower. True. That beats the cost of buying an ereader or tablet. I am hoping those become more affordable so there is incentive to paperless. I like reading the newspaper every day. If I see something like a recipe that looks good it only takes a few seconds to cut it out instead of turning on the desktop, finding the recipe again online and then printing it out… I enjoy reading a book as well instead of an e-reader or such. I guess that makes me a little old fashioned but a lot of our books are bought second hand, often at the local library book sale. Online I tend to run around with Mr CBB and company!!! Have a good day!! Try Evernote. You can store all of your digital copies in place and they are text searchable. We use this for our recipes and it works great. Lol. I am not sure what the truth is but I like the portability of electronic reading. My ipad is very easy to take to work and saves me the weight of books. I have been reading a lot on the computer lately, books and magazines alike. I much prefer to flick real pages but can’t find many things to read around here. If there was some choice I’d be happy to pay a little extra to read on a real support. It also makes my eyes tired after a while so I can’t read as much on a computer. I find pages make me more tired. Funny. I guess it comes down to preference. I like the ease of transport with electronic. Interesting. I find the paper makes me sleepy and not my ipad. To each their own I guess.